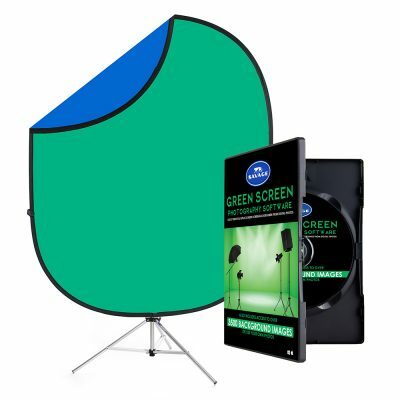 Green screens or blue screens are used as backdrops in chroma key photography, which is a process that replaces a solid-colored background from behind the subject of a photo (or video) with a new background. When you watch the weather forecaster on TV standing in front of a map, or Spiderman climbing down a building, you, my friend, are seeing chroma key photography at work! 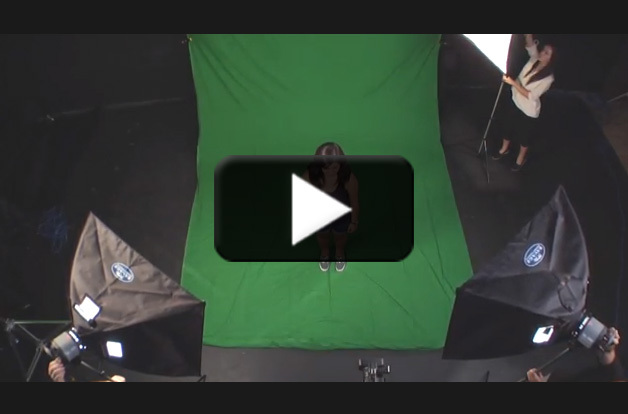 The practice of chroma keying can seem daunting at first, so be sure to read through this guide to green screens to get started on the right track. Can a beginner really do this? 1. Digital camera. You’ve got one already, right? 2. A computer. Either a PC or a Mac is fine. 4. Chroma key photography software. As with most software, you’ll run into a lot of green screen programs that are only compatible with PCs. But there are some made for both types of operating systems. 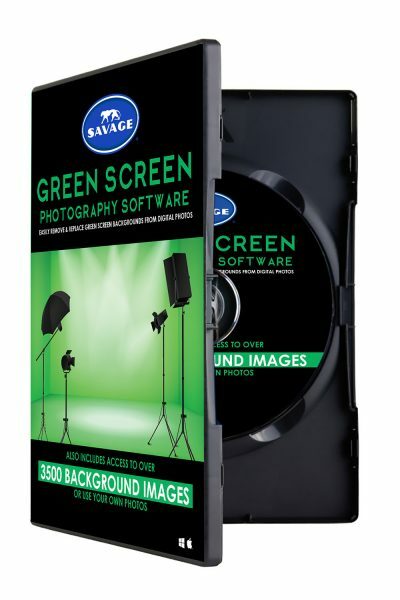 For example, the Green Screen Software by Savage is compatible with both PCs and Macs. SIZE: For example, 5’ x 7’ for photographing individuals, or 10’ x 12’ or 10’ x 20’ for group shots or full-body pictures. PORTABLE vs. STATIONARY: a collapsible pop-up screen or a rolled-up backdrop. MATERIAL: If you’ve taken a look online at green screen backdrop options, you’ve no doubt seen them in several types of material. 6. Background stands: If you have a studio and have been using other backgrounds, you may already own a stand to hang backdrop rolls from. But if you don’t have a studio set up, or the money or space for background stands, look for one of the smaller, collapsible green screens that comes with hanging hooks or a portable stand. 7. Studio lighting: Getting the best possible contrast between your background and your model is key for chroma key work, so you’ll need a well-lit green screen. For outdoor shooting in brightly lit areas, you’ll probably be fine with natural light. But for indoor shots, you’ll need professional equipment. 8. Digital backgrounds: Here’s the fun part! Selecting a new photo background for your subject. Let’s say you want the look of a studio backdrop. You can select digital backgrounds that look just like muslin. Or if you prefer your subject in a more natural setting, look for digital backgrounds with trees, mountains, or waterfalls. For fun shots, there are backgrounds of famous landmarks, or you can put your subjects in a frame with a holiday greeting on it. The available choices seem to be endless! The Savage Photo Creator Kit comes with an extensive image library of 3,500+ digital backgrounds to choose from! 9. 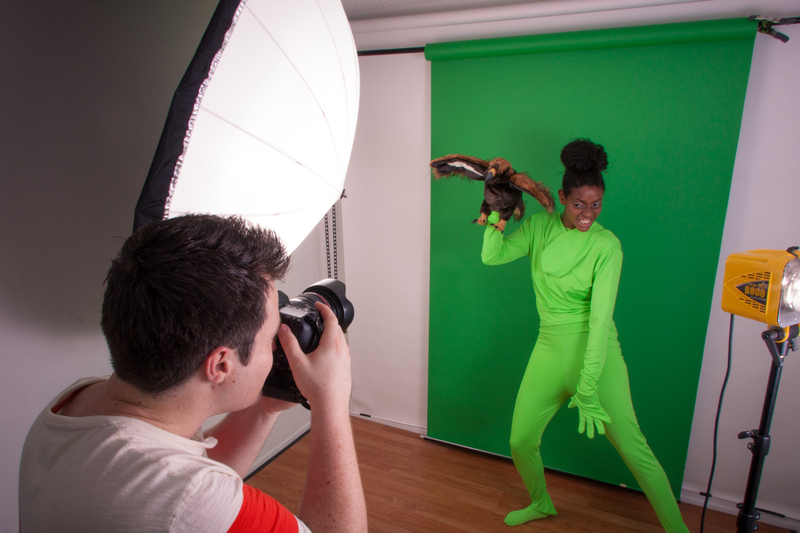 Depending on your project, you may need a green screen suit! Check out this helpful video to learn how to use one. Ready to get started? Here are the steps! 1) Set up your green screen background. If you’re using a portable stand, figure out how to stabilize it so it doesn’t flap in the breeze or move around as your model moves around. 2) Get the wrinkles out. Foam-backed screens are virtually wrinkle-free, but more costly. 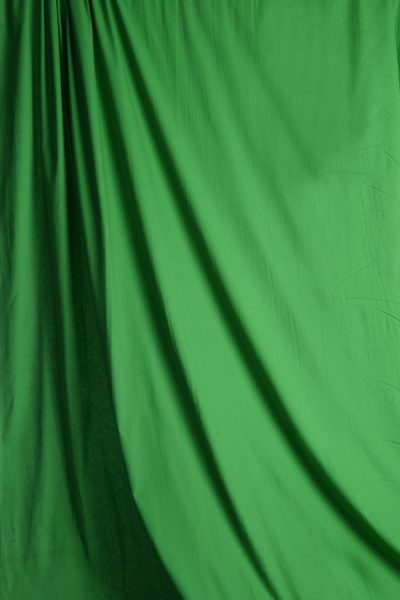 If you have opted for a fabric green screen, you can get rid of wrinkles by spraying it with water or a handheld steamer. Try to stretch it tight as it dries to reduce the lines that may cause shadows in your background. 3) Set up your lighting for the green screen. You need to light the screen separately from your subject, taking care that your lighting is even and doesn’t create shadows or hot spots. Chroma key software works best when the background has uniform color across its surface. 4) Select your digital background for the shot you are planning. 5) Set up your lighting for your subject. Study the direction of the light in the digital background you have selected for your new backdrop. Which way do the shadows fall? Try to mimic this angle of lighting on your model. Matching the intensity of light will also help make your composite photograph look much more realistic. 6) Position your subject. Avoid shadows falling on your green screen by putting some distance between model and screen. Experiment with your own lighting and subject until you don’t see any dark shadows on the backdrop. More distance from the screen will also cut down on any reflection you might get if green light bounces off the screen. This can help avoid an unpleasant other-worldly green glow around your model—unless perhaps you’re going for that look. 7) Keep the model fully in front of the green screen. Any part of the body or costume that doesn’t have the green screen background will have a different background which the chroma key software cannot remove. 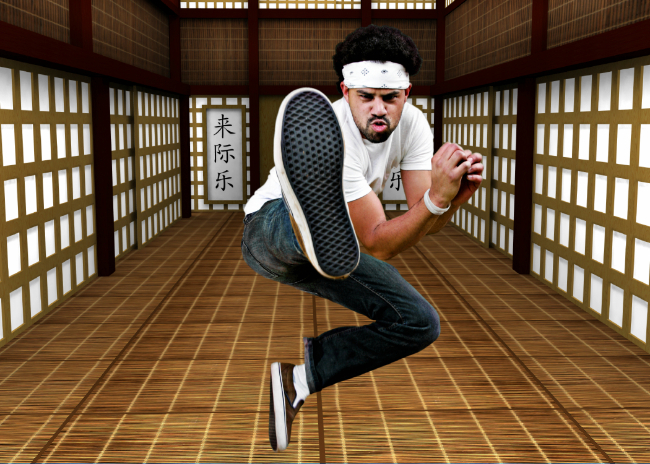 Knocking out that unwanted background on your own can be a long, frustrating process with your photo editing software. So, keep those arms and legs inside the screen, kids! 8) Download your image to your computer. 9) Select your photo, then follow the directions on your software. Easier said than done? Well, here’s a YouTube video that walks you through how to use the Green Screen Wizard software mentioned before. This particular program is adept at removing any creases or shadows on the backdrop. That would be a great feature if you’re just starting out with green screen photography. Presto, change-o! You did it! Now, enjoy the result of your first try using green screen photography and digital backgrounds. Doesn’t it look great? And you thought you were just a beginner. If I buy your software can I also add my own backgrounds for the green screen or can I only use the backgrounds that come with it ? Hi Frankie, thanks for your question! Users can import their own jpgs into the software, in addition to using our image gallery. We hope this helps! Hello! I was just wandering if a green screen can handle being put under water? Hi Liam! Thanks for your question. We have a few different green screen materials and the two we think could work under water would be our Chroma Green Solid Muslin Backdrop or our Chroma Green Vinyl Backdrop. What if the player is wearing a uniform that has green as part of the uniform? Hi Jim, great question! In that case, we suggest using a blue screen. Check out more about green screens vs. blue screens here: https://savageuniversal.com/blog/green-screens-vs-blue-screens/. Hope this helps! I’m brand new to green screens, I ordered a 9×13 green screen, of the 13′ height, how much should I use for the height and how much should I have on the floor ? Hi Gary! If you’re working with people, you probably want the backdrop 8-10 feet tall in the back. Thanks for the reply, I read places where the further away you stand from the green background the better, but at least 3 (or 4 feet ?) I think I read, that is why I wanted to not have the background height any higher than necessary so there would be more length on the floor. You said 8-10 feet tall, but would 7 feet tall still work okay ? That way I would have 6 feet on the floor and have room to walk some and still stay at least 3 feet away from the background. Thanks ! Hi Gary, as long as the backdrop is taller than your subject you should be okay! Hi!! If I buy this software for my students can it be installed on more than one computer? Hi Tina! Thanks for your question, the software can be installed on up to three computers. The Serial number you received with your purchase will expire after three installations. Hi I am just wondering if I have a green background, do I need to use ur software to complete the transaction of replacement of the subject to another background?? Like cut out the subject and paste onto the background they choose?? Hi Daisie! Great question. Our software makes chroma key easy and with just a few simple steps you can swap out backgrounds without requiring an expert level of photo editing skills. We hope this helps! Hi, I am wanting to make videos with various backgrounds. Does your software work with videos or only pictures? Hi David! Thank you for your question. 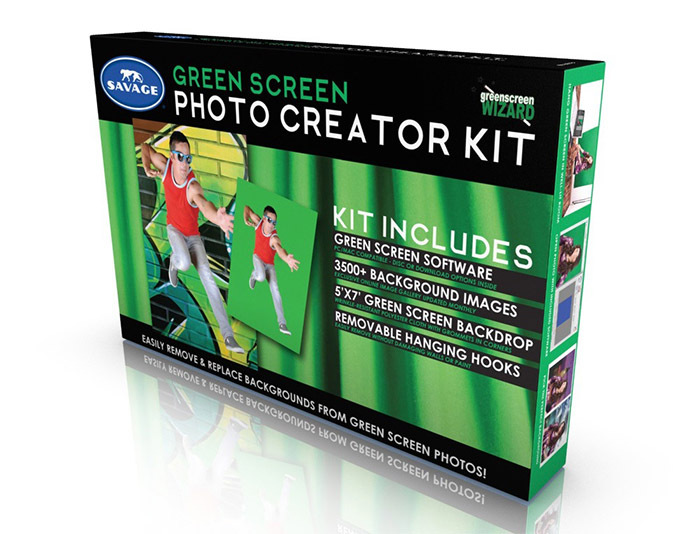 At this time our green screen software is only compatible for still photography, not videos. If I have a green screen set up is there a way to only buy the software program? Hi Kristen! Yes, we offer just the Green Screen Software: https://goo.gl/y3fSMi. Please let us know if you have any other questions. Many thanks for your green screen explanation. As I know from my research, using green back screen has a plenty of advantages like controlling environment, enhances editing, portability, faster production time, and extend usability. What advantages your software can provide me then? 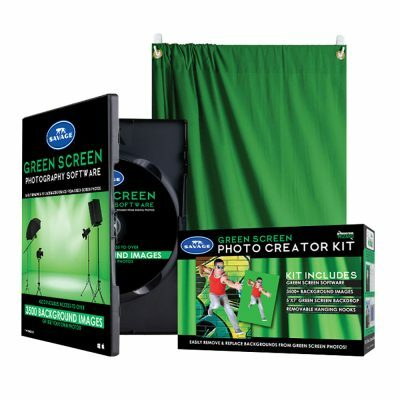 Hi, I’m wanting to set up a green screen to take pictures with my kids. Can I use your program on a tablet or would I need to purchase a laptop? Hi Ellan! At this time our Green Screen software is compatible for PC and MAC computers. Please view the full system requirements here: https://savageuniversal.com/products/green-screens-digital-backgrounds/green-screen-software/. Thank you! This is an amazing post . I read this blog careful . So much thanks for this post . Hey there, is there a certain color/hue green screen that you need to use? Hi Ron! Our Green Screen Software is a stand alone software and would be a great tool to import the photo booth photos to after a session. We hope this answers your question! I am endeavoring to make a film utilizing amazing wall hangings as my background. What must I do as I would love to video action over a green screen and lay that green screen action over my backgrounds. Hi Alan, your project sounds cool! Our Green Screen Software is a great, easy to use tool for still photography project but we do not offer video software at this time unfortunately. I have a 10×12 green screen and my client is sending me a custom image to use at an event. What is the best size to tell them to make the custom image and should it be a jpg? How can I research the digital backgrounds? At this time, in particular, I am looking for a tropical background with palm trees, mountains perhaps rocks and a blue sky. Hi Joyce! We suggest searching stock imagery websites if you are looking for a specific image. Let us know if you have any more questions! Sorry, i meant, I’m wondering if I buy your software how can I find out in advance what digital backgrounds come with it. Thanks again. Our web gallery of high quality digital backgrounds consists of 3,500 images of all different designs from nature landscapes and iconic landmarks to patterns and textures. Our beach/waterfall category currently has over 130 images within it, while our nature landscape category has almost 600 images within it. We are confident you’ll find a great natural beach image, and also please keep in mind you can also use your own jpg within the Green Screen Wizard software as well! Hi Savage Support Team, thanks you very much for your Green screen guide. I do photography, photo editing & vector conversion. Green background is effective for removing background and easer to add any background. That’s why I need to buy a package where I get various background for my product photography. Can you help me for this? I’m looking to start offering fantasy shoots for children. Does your gallery incude much material like this? Hi Mark! Our green screen gallery offers over 3,500 images so we are sure you will find some that fit your need! You are able to use your own images with our software as well. Hi Savage Report Team, I was wondering do a Green Screen work perfectly if I sit close to it or are should I have a distance between me and screen to get it? Im a Youtuber who make reaction and gaming videos, and every time I make a video, I see shadows with a lot of noise on the screen when I’m editing it. Hi Terrance! The key to successful chroma key is lighting the backdrop evenly, to eliminate shadows. To do this, it is usually easier to create distance between the subject and background. We hope this helps! Hi Jai! Thank you for your question. Unfortunately no, red is most common in human skin tones and would cause interference with swapping the background. We recommend checking out our blog, Green Screens vs. Blue Screens (https://savageuniversal.com/blog/green-screens-vs-blue-screens/) to learn more! Wonderful green screens video make idea share. So helpful to me. Thanks for share this. Hi, I am mainly focusing on using the green screen indoors for portrait photography. However, I am planning to participate in an outdoor fair to promote my business. Do you think the natural lighting outdoors will make a difference on my subject for my portraits still using the green screen in the background? Hi Hriaan! If the background is evenly lit and lit separate from your model, either natural light or artificial would work and as long as the surface is not reflective then the light can be spread evenly across the screen. We hope this helps! Im seeing kits that look in the photos to be pretty much the same, a mix of a goalpost like stand for a backdrop, white, black and green backdrops. Some umbrella or softbox lights, bulbs, kit bag and a weighted above head soft box. However Im seeing in Amazon or ebay etc kits of around £50 to £70 and others looking the same, muslin material etc that are priced around £500 to £700 +. Frankly what is the difference and what kind of kits would be suitable for beginners for audition , video presenter for you tube, some basic effects and photos. What do I really need and what don’t I to get started, so not gettign kit thats over priced that I will not need unless totally pro and Hollywood level but also is not a load of cak that falls apart and is useless, what is it that those in the know, know thats needed and whats a rip off. Hi I am about to start making youtube videos with my kids and we wanted to know if we were to purchase your product would we be able to set up a green screen behind them and use images that match their topic of choice like for example if they were going to do a science experiment would we be able to set it up behind them so i could look like something dealing with science? Hello, I have been working on photographing insects with plain black or white backgrounds. My trouble is sometimes i would like to change from one coloured background to the other. To avoid changing the backdrop could a greenscreen be used even if the subject is stand on the greenscreen?